Welcome back, or if you’re tuning for the first time, a very special welcome to you. I’m so glad each of you are here. You have so many options for Bible study and yet so many of you keep tuning in week after week. Wow and wow. I had a great idea turned in by a regular listener, who also happens to be my wife, and I thought it was a fantastic suggestion, so beginning today, I’m going to suggest a verse from each book to memorize. I’m a big believer in Scripture memorization and can’t wait to get this started. I also had two listeners suggest that I start making the show longer. First, thank you. I am honored that some of you are wanting more. Secondly, I doubt that I’m going to increase much, at least in the short term. Once we get into slightly deeper water after we finish our survey and start looking a little more closely at each book, things might get a little longer, but for now, thanks for wanting more. I hope that’s still true a year from now. 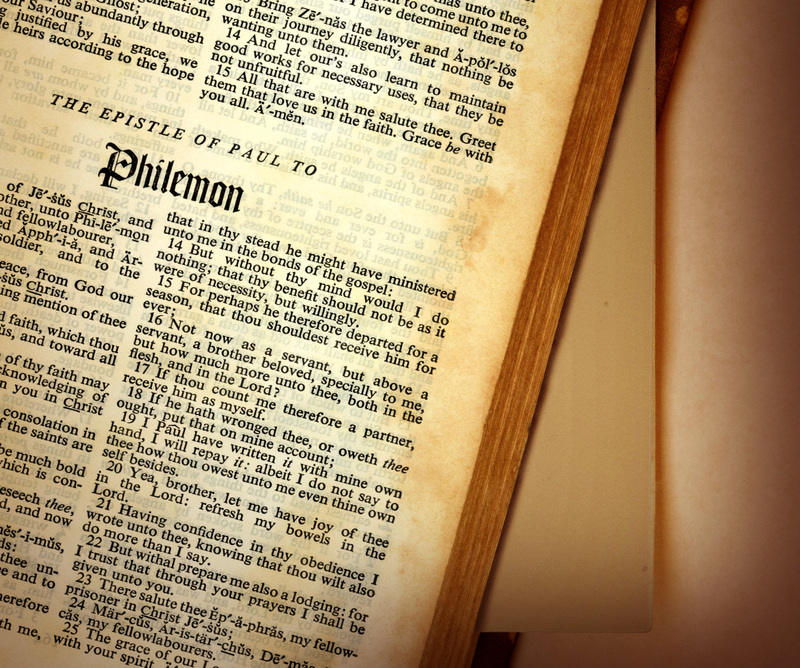 For today, we’re turning our attention to the book of Philemon. It is the shortest of all of Paul’s letters and is in many ways the most unusual. It looks like Philemon was written at about the same time he wrote the Book of Colossians, which is about A.D.60. While Philemon is not mentioned directly in Colossians, the subject of the Book, Onesimus, is, as are Philemon’s wife Aphia, and one Archippus, who is likely their son. From Paul’s early encouragement in the letter, it sounds like Philemon may be a leader, and a wealthy one at that, in the Colossian Church. Paul writes as if they are good friends. There is little doubt that Philemon is the most personal of all his letters. He writes in an extremely intimate manner and the letter is loaded with puns and tongue in cheek humor. Sadly, many of the jokes and puns are lost in translation, but while he is dealing with an extremely serious matter, he does so as friend to friend. Phm 1:6 My prayer is that our fellowship with you as believers will bring about a deeper understanding of every blessing which we have in our life in union with Christ. It keeping with the somewhat light hearted, but serious nature of the letter, Paul uses all this back patting as a set up for the main subject which is Paul’s request that Philemon welcome back his runaway slave, Onesimus. Onesimus, for reasons we don’t know, ran away from Philemon and ended up in Rome. At some point, he looked up Paul in prison and ended up becoming a Christ Follower. Now Paul wants Onesimus to go home and resume his life there. The sticking point is, as a runaway slave, it is Philemon’s legal right to have him beaten severely or even killed. But Paul spends the bulk of the letter, which is only one chapter, coaxing and guilt tripping Philemon into taking Onesimus back with no strings attached. First, Paul says that Onesimus is his true spiritual son, suggesting that hurting the slave would be hurting the apostle. Then he uses a play on words to make his point. Onesimus means useful. Paul says, I know he was once useless, but know he is Onesimus, useful. Frankly, that’s really cute. Paul is using humor again to make a serious point. I can almost see him chuckling as he grabs the pen and writes his thoughts. Then he goes on to say, with tongue firmly in cheek, ‘While I will gladly pay you, I won’t mention that you owe me your very self. And if that’s all not enough guilt, Paul adds a final goad by saying, oh, fix up a room for me, I expect to be released soon and can’t wait to visit you and the family. Philemon is pretty much in a corner. In this letter, Paul is changing the game in how slavery is played. In several places the New Testament mentions how slaves and slave owners should interact. Now, Paul is upping the ante by asking Philemon directly to change his behavior toward his slaves. Many skeptics point out quite accurately, that the New Testament does not overtly condemn slavery, and that causes much head scratching among 21st century people. But the New Testament does not get involved in any Political Matters. The Gospel isn’t about changing policies, but about changing hearts, and policies will change as a result. Paul says we are to obey the government and pray for all those over us. He tells slaves to respect their owners and owners to respect their slaves, but that if a slave gets a chance to gain his freedom, he should take it. He also says that in Christ there is no Jew or Gentile, slave nor free, nor male or female. He totally changes the rules. Here’s the kicker, as hearts changed, practice changed and Christians became the first to free their slaves. It’s just hard to view all men as equal and support slavery. Heart change is always superior to coercion, because it’s lasting. 1801, in Kentucky, was the peak of what is historically known as the ‘2nd Great Awakening’. It was a huge revival across North America. On of the locations of the huge revivals was at the Cane Ridge Church in Bourbon County. One of my heroes, Barton W. Stone, was a leader in that revival and Pastor of the Cane Ridge congregation. The Cane Ridge Church had many slave owners and slaves as part of the members. The building had a balcony, or loft, which was where the slaves sat, while the owners sat on the floor level. Such was the revival among the Church that by the end of 1801, the members tore out the slave balcony and the meetings were integrated. By 1804, every member of the Church had freed their slaves. No revolution, no riots, no bloodshed, they merely followed where the Gospel led. Secular America had to fight a war to end slavery. The Holy Spirit melted it away. When it comes to matters of Social Change, I am firmly convinced that the Church should lead the way. Think about it. Well, that’s all I got. Read Philemon and determine what ways the Holy Spirit is asking you to trade stinkin’ thinkin’ for seeing the world, and her people in a brand new way. When I was a boy, I always wanted a pair of those ‘X-ray’ glasses they sold on the backs of comic books. These days, I want to see with Jesus’ eyes. I can’t wait till next week when we get started on the ‘Open Letters’, or General letters. We begin with Hebrews, which I believe is the key for every Christian to understand the Old Testament. Man, I’m excited. Until then though, have a great week. Be blessed, and, be a blessing.